Another wonderful and imaginative film by Studio Ghibli, Kiki's Delivery Service brings us yet another intriguing and magical experience to the silver screen. If it's one thing Studio Ghibli does well, it's charming a viewer with something whimsical and fantastic. 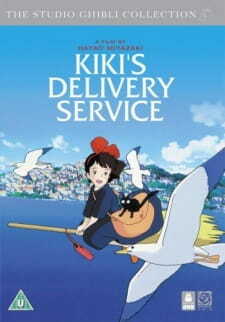 And that's what Kiki's Delivery Service is, most definitely. The story is pretty sweet and simple. A young apprentice witch named Kiki goes to a busy town to hone her witch skills. She is employed by a local baker and his wife to deliver baked goods via flying on her broomstick. Saying she gets into various scrapes and hijinks ensue would be belittling the plot. Lots of small things happen with a rather big event that comes along at the end of the movie, but the most important thing is that all these events are important to Kiki herself, no matter its significance to the wider world. Meeting an artist, helping an old lady bake something, saving the city; it all means something to Kiki. More than fantasy, the story has stronger slice of life themes. This movie is slow-paced, but it's bursting with so much energy and life from its scenes. As expected like any other Studio Ghibli anime, you can pick out the distinct art style instantly. Of course, it does look old, but this is an old anime. Yet, it has some impressive visuals for such an old anime. Children and adults alike will love the art instantly. Sound acting was impressive as well. It suited the anime very much. Many reviewers noted that the original Japanese voice acting is more suited for the anime than the English dubbing equivalent. Studio Ghibli has a much subtler take on feminism, so they didn't lunge ballad-like songs down the listeners' throats. The Japanese soundtrack was very fun. Kiki's Delivery Service has a great ensemble cast. There's Kiki, a hard-working, upbeat young witch who tries her best at what she does. It's funny that she is more excited about simple things in life when everyone else is fascinated that she is a witch. There is a young boy she befriends, who is sort of a geek, but he knows how to have great simple fun. Plus, there is the baker, and there's his wife, who offer Kiki a lot of emotional support. They sort of serve as surrogate parents for the young witch. And of course, there's the talking cat Jiji. He is pretty humorous, with his one-liners and random comments. Overall it was tremendously fun film to enjoy. Another impressive and engaging storyline just makes you want to re-watch it many times without fail. You will find it refreshing and enjoyable to watch with the younger generation. The magical experience brought by Studio Ghibli is all here once again.